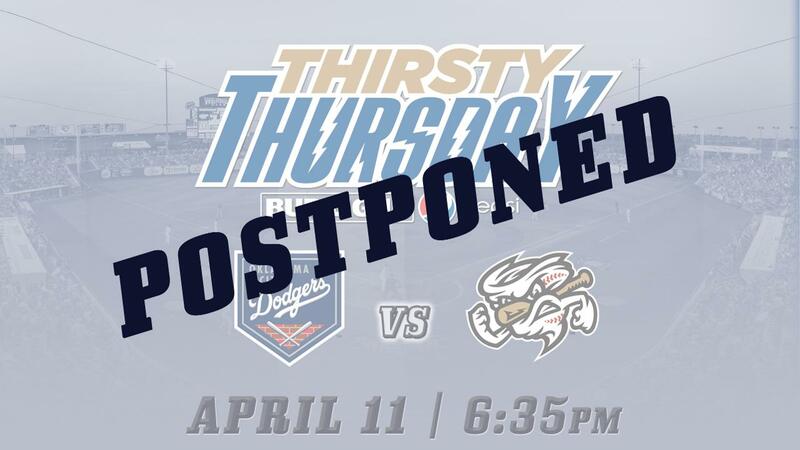 Thursday's scheduled matchup between the Omaha Storm Chasers and Oklahoma City Dodgers at Werner Park has been postponed due to inclement and cold weather. The game will be made up as part of a doubleheader on Monday, May 27, with game one slated to start at 12:05pm CT. Both games will be seven inning contests, with game two starting approximately 30 minutes after the conclusion of game one. Tickets to that day's regularly scheduled matchup will be good for both of that day's tilts. Fans with a ticket to Thursday's game may exchange that ticket in-person at the Werner Park Ticket Office for a ticket of equal/lesser value to a 2019 Storm Chasers home date at Werner Park excluding July 4. No online or phone exchanges will be accepted. Fans may call the Storm Chasers' Weather Hotline at any point during the 2019 season for up-to-date information on the status of a day's scheduled game at (402) 738-2199. The Storm Chasers are set to continue their homestand on Friday evening to begin a four-game series versus the New Orleans Baby Cakes. First pitch is scheduled for 7:05pm CT.
Tickets are available for that game and all remaining 2019 Storm Chasers home contests, and may be purchased online at www.omahastormchasers.com/tickets, or through the Werner Park Ticket Office during open hours from noon until 6:00 p.m. Monday through Friday either in-person or by calling (402) 738-5100.